Border Collie originated in the Border country between Scotland and England where the shepherds’ breeding selection was based on biddable stock sense and the ability to work long days on rugged terrain. 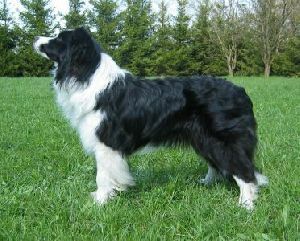 As a result of this selective breeding, the Border Collie developed the unique working style of gathering and fetching the stock with wide sweeping outruns. The stock is then controlled with an intense gaze known as “eye,” coupled with a stalking style of movement. This selective breeding over time developed the Border Collie’s intensity, energy and trainability which are features so important that they are equal to physical size and appearance. The Border Collie has extraordinary instinct and an uncanny ability to reason. One of its greatest assets is the ability to work out of sight of its master without commands. Breeding based on this working ability has made this breed the world’s premier sheep herding dog, a job the Border Collie is still used for worldwide. Expression is intelligent, alert, eager, and full of interest. Eyes are set well apart, of moderate size, oval in shape. Any eye color is acceptable, but blue eyes in dogs other than merle are not preferred. Eye rims should be fully pigmented. Ears are of medium size, set well apart, one or both carried erect and/or semi-erect (varying from one-quarter to three-quarters of the ear erect). When derjaw is strong and well developed. Nose should be fully pigmented. Nostrils are well developed. A full complement of strong healthy teeth should meet in a sissors bite. Neck is of proportional length to the body, strong and muscular, slightly arched and blending smoothly into the shoulders. Topline – Back is level with a slight muscular rise over the loin, falling to a gently sloping croup. Body is athletic in appearance with a deep, moderately broad chest reaching no further than the point of the elbow. The rib cage is moderately long with well sprung ribs. Loin is moderately deep and short. Underline should have a slight but distinct tuck up. The tail is set on low and is moderately long with the bone reaching at least to the hock. The ideal tail carriage is low when the dog is concentrating on a given task and may have a slight upward swirl at the end like a shepherd’s crook. In excitement it may be raised, but the base of the tail should not curve forward over the back. Two varieties are permissible, both having close-fitting, dense, weather resistant double coats with the top coat either straight or slightly wavy and coarser in texture than the undercoat which is soft, short and dense. The rough variety coat may vary in length without being excessive. Proper texture is more important than length. Forelegs, haunches, chest and underside are feathered and the coat on face, ears, feet, fronts of legs is short and smooth. The smooth variety is short over entire body, is usually coarser in texture than the rough variety and may have slight feathering on forelegs, haunches, chest and ruff. Neither coat type is preferred over the other. Seasonal shedding is normal and must not be penalized. Excess hair on the feet, hock and pastern areas may be neatened for the show ring. Whiskers are untrimmed. Dogs should be presented naturally, without excessive trimming or sculpting. Click Here to Learn about breeder background checks on Bored Collie breeders if you are looking for Bored Collie puppies for sale. Click Here to learn how ResearchBreeder.com can help you find healthy Bored Collie puppies for sale. Click Here to order a Breeder or Kennel Background Check on Bored Collie Breeders that may have Bored Collie puppies for sale. Click here to find the national breed club for Bored Collie puppies for sale. Click Here to purchase a list of approved ResearchBreeder.com Bored Collie Breeders who have Bored Collie puppies for sale.